KIEV, Ukraine -- Ukraine is planning an operation involving tens of thousands of police to guard against any attack by separatists or Russian agents during World War II commemorations next month, security chiefs said on Tuesday. 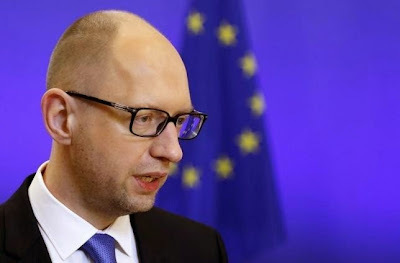 Ukraine's Prime Minister Arseny Yatseniuk. Tension is mounting in the capital and other cities amid an increase in rebel attacks in the east. Kiev said one Ukrainian serviceman had been killed in the past 24 hours, in an attack near the airport in Donetsk. The killings in Kiev of two pro-Russian activists, a journalist, by what appeared to be professional hitmen, have further driven up tension in the run-up to May 8-9 celebrations of victory in 1945, which traditionally bring thousands of people on to the streets. "We cannot trust the word of Russia and their terrorists at all. We must be ready to give a clear, appropriate and strong reply to protect people on the streets, provide warnings of terrorist attacks and bring those guilty of crimes to justice," Prime Minister Arseny Yatseniuk told security chiefs. Calling for heightened security measures, particularly in large cities, Yatseniuk said Russia was spending a lot of money on financing networks to stir up trouble. "We are fighting a state which has planned dozens of terrorist acts and we must do all we can to head them off. Social, political and ideological detribalization -- that's the aim of Russia." he said. A total of 20,000 extra security and police would be drafted in for the May festivities. "We are ready to ensure calm," he said.